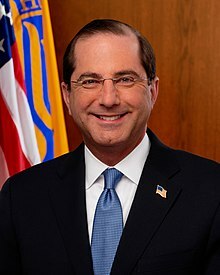 The United States Secretary of Health and Human Services is the head of the United States Department of Health and Human Services, concerned with health matters. The Secretary is a member of the President's Cabinet. ↑ 1.0 1.1 Harris was Secretary on May 4, 1980, when the office changed names from Secretary of Health, Education, and Welfare to Secretary of Health and Human Services. Because the department merely changed names, she did not need to be confirmed again, and her term continued uninterrupted. This page was last changed on 11 April 2019, at 14:40.